Gov. Sarah Palin's political ambitions could be torpedoed by waning support from the political center. With his runoff race ending on Tuesday, Georgia Sen. Saxby Chambliss called in the party's big guns—and Sarah Palin answered the call, stumping across the state today and tomorrow. It's a clear sign of her stature within the party. In mid November, Gallup found that only 45 percent of Americans hoped Palin is "a major national political figure for many years to come." About three-quarters of Republicans hoped so, three-quarters of Democrats hoped not, as did 53 percent of independents. Exit polls also showed that 64 percent of independents viewed Palin as unqualified to be president, with nine of ten Democrats and one in four Republicans agreeing. "Palin's image, being the way it is for independents, puts her at a distinct disadvantage from a general election standpoint," said Tony Fabrizio, a veteran GOP strategist. "But it wouldn't be the first time the hard-core base ran off the cliff." The GOP intra-party debate over Palin has become a proxy for the larger question of her party's future, and conservative chieftains like Ethics & Religious Liberty Commission President Richard Land fear that attacks on Palin are at times veiled swipes at the party base. "It would be a mistake to say that social conservatives have all their hopes and dreams vested in Sarah Palin," Land said, but he added Palin "does have the one thing you can't coach, charisma," and continues to have "star power" with conservatives. She has less, though, among moderates even in her own party. Among moderate and liberal Republicans, Palin dropped about 20 points, falling behind Romney as the group's preferred 2012 nominee. Conservatives still dominate the GOP primary process, and in key primary states like Iowa and South Carolina about six in ten GOP voters are also white evangelicals, who overwhelmingly support Palin. "She is the most popular speaker in the Republican Party," said Katon Dawson, who heads the South Carolina GOP and on Monday announced his bid to direct the national party. "The first impression of Sarah Palin is that she is a Republican warrior who took a pretty good licking, and a lot of it unfair," Dawson said. "Sarah is going to be one of the leaders in the party like Bobby Jindal, like Mark Sanford, like Rick Perry." Ed Rollins, who ran presidential bids for Republicans including Ronald Reagan and Huckabee, argued that "independents are something she can focus on later." In the end, though, Rollins expects that Palin "will be very similar to [Dan] Quayle." "When he started to run, [Quayle] got nowhere," Rollins said. "The potential is there [for Palin] but out of 10 weeks she had two good weeks." For the 2012 race, "she's now not starting at the top but starting at the bottom," he said, adding that Palin would have to campaign for years in Iowa and New Hampshire to mount a viable campaign. Of course, a potential 2012 bid for Palin depends in large part on how Republican insiders come to view her vice-presidential bid this year. 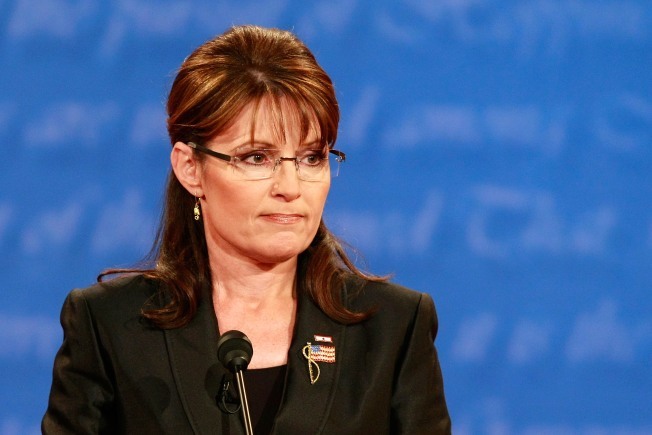 Public polling makes clear that Palin's role in the ticket's demise was much exaggerated. While the economic crisis was the most important concern of a majority of voters, and undercut McCain, the one public figure who weighed down the Republican nominee was the Republican in the White House. In the three of the most closely watched swing states—Florida, Ohio and Pennsylvania—the Quinnipiac University Poll shortly before the election found that more than twice as many voters thought George W. Bush was detrimental to McCain than said the same of Palin . Yet clearly Palin became a more polarizing figure as the campaign went on, in part because she took on the role of chief critic of the Democratic nominee. Republican support for the Alaska governor never wavered in the campaign, as Gallup tracking shows that at least eight in ten Republicans viewed Palin favorably from early September on. While most Democrats disapproved of Palin from the outset, her negatives among them climbed steadily as the campaign progressed. The trend was even more pronounced among independents, among whom her negatives went from 23 percent just after the convention to twice that by the days just before the election. In Florida, Palin's overall favorable rating held steady at 47 percent between mid September and mid November, according to Quinnipiac, while her negative rating rose from 23 to 42 percent. The same trend was seen in Ohio and Pennsylvania . Demographics also influenced how voters viewed Palin, as the first women to hold a place on the Republican ticket proved a more divisive figure for women than for men. Women were also split by where they lived, with those in the suburbs viewing her unfavorably by a 37-54 margin, mirroring the 54-37 favorable view of women living in small towns and rural areas, according to NBC News-Wall Street Journal polling taken only days before the election. Suburban men split about evenly in their views of Palin, while rural men saw her favorably by a 48-34 margin. In the end though, it's not clear how much impact Palin's selection had on the 2008 race, as those who said her addition to the ticket was an "important factor" in their presidential vote leaned slightly to McCain, 51 to 48 percent. Even that poll, though, shows Palin's trouble with the center. While only one in four independents said Palin was an "important factor" in deciding whom to support, those voters backed Obama by a 74 to 20 percent margin. Among the one in four independents who said Palin was an "important factor" in deciding whom to support, 74 percent backed Obama. Palin is now reportedly fielding hundreds of media interview requests, including from Oprah Winfrey, as well as lucrative offers for everything from her own television show to book contracts—but to revive her national image, many Republican strategists believe Palin must now step off the national stage. "Palin needs to demonstrate growth above all else, if she is capable. She needs to retire from the field, endure a period of introspection, and renew herself before she can attempt to return," said Alex Castellanos, a GOP media consultant who most recently advised Mitt Romney during his 2008 presidential campaign. "Unless she retires from the field soon, the cement will set on the Sarah Palin we know now." That Palin has a reputation as an intellectual lightweight reinforced by Tiny Fey's caricature of her on Saturday Night Live. It's this perception that has already led some Republicans to conclude her national political career will quickly fade. "'Never' is a word you don't use in politics. But having said that, it is difficult for me to imagine her as the Republican nominee in 2012 or 2016," said John Weaver, McCain's top strategist in his 2000 presidential bid. "You know, some of the negatives about her are now ingrained in the public lore. They are not the negatives that you accumulate in the rough-and-tumble campaign. These are negatives that go to the core of a person, whether she has the ability to serve in national office." Those views were reinforced by anonymous criticism from within McCain's camp, most notably the charge that she did not know Africa was a continent. Palin though has her defenders within the McCain campaign as well. "She's plenty smart. She's brilliant. She's incredibly talented," said Charlie Black, who was one of McCain's top advisors. Black conceded that the Alaska governor may have been "thrust on the national scene before she was fully capable." But he added, "she's got several years to build on her record. Understand, that the political environment when she came on the scene was the worst for Republicans in 34 years. She also took a pounding that was unfair. "She can overcome that," Black continued. "She is a charismatic person that has shown she has guts." Or as Land put it, "There is nothing said about Palin that wasn't said about Ronald Reagan. Grade B movie Star. Amiable dunce. And it really hurt didn't it," he added, with a pang of sarcasm. "Time will tell," said Land, "whether she's Ronald Reagan or Dan Quayle."